This composite screenshot shows you the visible elements of Utter Command. The command listed below each label calls up that element. 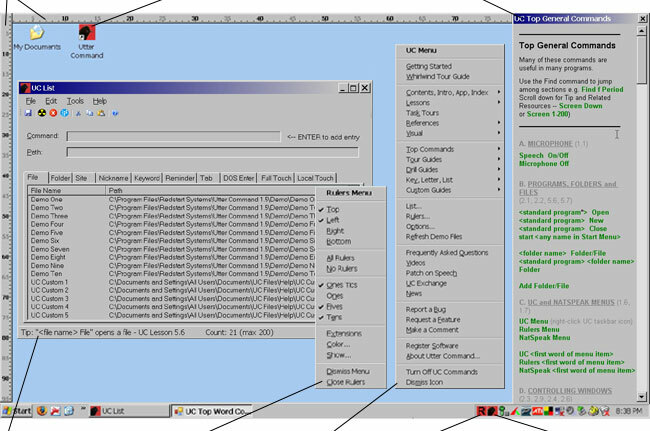 The Utter Command menu gives you access to all of Utter Command's elements. The UC List allows you to organize your own File, Folder, Web Site, email Nickname, Keyword, Reminder, form, commandline and mouse click lists so you can use a single command to get to any file, folder or Web site, set up an email message, find any keyword in any document, set a reminder, fill out multiple form fields, execute any command line command, and click the mouse once or twice in a row. 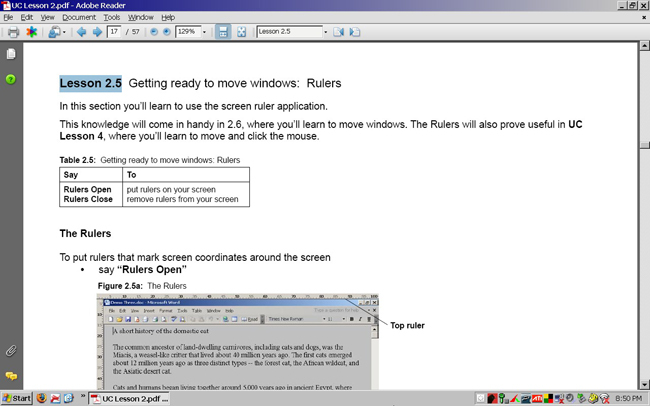 The UC Rulers utility puts rulers around your screen so you can more precisely place the mouse and move windows. The 36 On-screen Guides are lists of helpful information that appear in a window on the right side of your screen. They include lists of program commands like Top Word Commands, tour scripts like the UC Whirlwind Tour, drill guides like Key Combinations Drills, reference lists like the Alpha-Zulu words, and seven custom guides that you can use to keep your own notes or lists. Utter Command also provides audio feedback in five situations where it's important to know what's happening and visual feedback is absent or insufficient.